Porcelain Veneers are a thin shell of porcelain that is attached to the natural tooth to cosmetically create a beautiful smile. Porcelain dental veneers are an excellent cosmetic dentistry treatment that may be able to help you achieve the smile you have always wanted. Stained, crooked, misaligned, or chipped teeth can easily be fixed with porcelain veneers. In a process known as “instant orthodontics,” The Dentistry in Naples uses porcelain veneers to change the shape, length, and even alignment of teeth to create a beautiful smile. Porcelain veneers are thin, durable “shells” of porcelain that are bonded to the surface of teeth, enabling you to change the color, shape, and alignment of your teeth. They are very thin and created by a professional dental laboratory. Placing veneers is a more conservative procedure than crowns. Because they are made of porcelain, they are very strong and resist staining and chipping. Just like other dental restorations, veneers are very durable, but they may need to be replaced over time so you can keep your smile looking its absolute best. Teeth that are too small, or too large. What is the process of applying porcelain veneers? 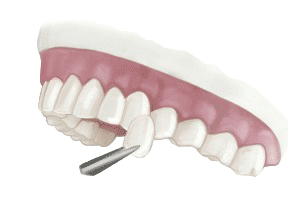 Porcelain veneers are typically applied in two stages. First, Dr. Cancilliere will prepare your teeth for the veneers placement, which requires the removal of a small amount of tooth enamel to make room for the veneers. During the second stage, which occurs after the veneers have been crafted to meet your individual needs, they are applied and adjusted to ensure a natural-looking, beautiful result. Our office does offer both traditional and minimal prep/no prep veneers. For select cases we are able to do them in house with our CEREC CAD/CAM and milling technology.